A Guide To Trip Over Tools Work Accident – How Much Compensation Can I Claim? For many professions, and especially those working in manual professions, accidents in the workplace (such as a trip over tools work accident) are all too common. No matter what your profession or role is, all workers and employees have the legal right to expect that their employer has taken every reasonable step to keep them from harm whilst in the workplace. This goes for regular places of work and any exceptional places as well, such as places you are visiting whilst working. As such, if an accident in the workplace does occur, such as slips, trips and falls, the injured party can make a claim for personal injury compensation. The Workplace (Health, Safety and Welfare) Regulations 1992 are designed to help protect workers from accidents, injury and to mitigate risk in their everyday working environment. The regulations require a duty of care from employers. They must keep workplaces safe and free from hazards. However, one of the most common workplace accident types is slip, trip and fall injuries, such as falling over tools. Falling over at work could potentially cause a serious injury and lead to long-term consequences. How Do Workplace Safety Regulations Protect Employees? Can I Make A Claim If I Tripped Over Tools? What Can I Claim For After A Workplace Accident? Why Choose Us For Your No Win No fee Compensation Claim? According to figures from the Health and Safety Executive, slip, trip and fall workplace accidents injured a total of 21,585 people in 2013/14. As many as 95% of these slip, trip and fall accidents resulted in a broken bone. Research carried out by insurance companies indicates that accidents such as a trip over tools work accident are the most common workplace accidents to cause an injury. 37% of accidents in the workplace and 50% of injuries to the public are caused by this type of accident. According to the (HSE) Health & Safety Executive, trip over tools work accidents are a quite commonplace. They can occur both inside and outdoors at the workplace. These areas can also include access to and from the place of work, such as car parks, walkways and entrances. The definition of a workplace can also include additional land, premises or other areas which are owned by someone other your main employer. There are numerous health and safety workplace regulations which govern and refer to aspects of safety and internal traffic routes in the workplace. Internal traffic around the workplace means the usual walkways and corridors. They take people around things such as workbenches or desks and should always be kept free from clutter, such as tools. If you have tripped over tools in the workplace due to them being carelessly left in these areas, you could have a personal injury claim case. “So far as is reasonably practicable, every floor in a workplace and the surface of every traffic route in a workplace shall be kept free from obstructions and from any article or substance which may cause a person to slip, trip or fall”. Having the right policies and procedures in place to ensure that tools are stored correctly and that any spills or waste is cleaned up. Keeping floor surfaces well maintained, enhancing slip, trip and fall safety. Slips can be caused by substances such as water, oil and other liquids. Providing correct tool storage facilities to prevent a trip over tools work accident. Carrying out regular risk assessments. These should also be done when there are any changes to the layout of a workspace or environmental changes. All of these steps are designed to reduce the chance of a slip, trip or fall hazard causing accident and injury in the workplace. If, or when an accident does happen, an employer can be held liable to compensation to the injured employee. This is especially the case if the employer has been negligent, or is in breach of their duties as outlined in the above legislation. 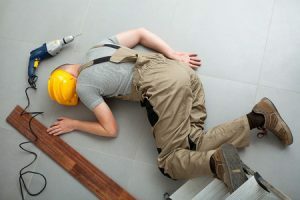 If you have tripped over tools in the workplace and the accident was caused by someone else or by negligence, you can have a legitimate case to make a claim for personal injury compensation. Assuming the accident happened in the workplace, you would make the claim against your employer. To have a successful trip over tools work accident case, you need to be able to present evidence your employer was in breach of the regulations. You will need to show that the breaches lead to hazards around the workplace in places where you should be walking, such as common routes around your workplace. If your workplace regularly has tools being left on the floor or in hazardous positions, or if there is no place to adequately store the tools, it is likely the workplace will be viewed as hazardous. Any costs that you incur in adapting your home and/ or car to accommodate any permanent life-changing injuries. Your compensation claim success will depend on factors such as how severe your injury is, what the long-term prognosis is and whether or not it will have an impact on your day-to-day life and any financial costs. Below is a table with some of the claim types and amounts you may be entitled to following this kind of accident. Knee Injury Serious-Moderate £20,250 - £33,200 Higher payouts will be awarded to disabilities, including damage to muscularture, cartilage damage to the soft tissue damage. Arm Injury Mild Injury £4,500 - £30,250 This amount covers injuries including restricted disability and restricted movement. Neck Injury Mild Injury £1,800 - £ 6,200 This covers injuries which are similar to and present like whiplash. Finger Injury Severe - Mild £375 - £69,330 This covers injuries such as the amputation or injury of a finger. Foot Injury Extremely Serious £64,000 - £152,750 The amputation of one of both feet will result in higher payouts. Back Injury Mild Injury £350 -£9,850 Mild injuries include damage to soft tissue and muscle pain as well as slipped discs. Wrist Injury Severe - Mild £2,550 - £44,500 Including wrist temporary damage through to permanent loss of function. To start your trip over tools work accident claim, talk to the specialists at Legal Expert today and discuss your accident. The first thing to do after you have received the medical attention you need is to discuss your case with a solicitor. They will be able to assess the likelihood of your claim for a slip, trip or call caused by a misplaced tool in the workplace getting compensation. Our team of solicitors are able to work with you through a conditional agreement. These are commonly referred to as ‘no win no fee’ agreements. Under these kinds of agreements, you don’t have to make any payments upfront or during the case. If your compensation claim is unsuccessful, you also won’t have to pay anything for our services. If your slip, trip and fall safety compensation claim is successful, your costs will be detailed in the contract we sign with you. Not all law firms will offer no win no fee services and not all do so on the same terms. If you choose to go ahead with Legal Expert, we will walk you through our fees, so there won’t be any nasty surprises. No win no fee agreements reduce your financial risk. And help those who might not otherwise be able to afford to bring a claim against their employer. There are no hidden charges or fees. You can learn more about our no win no fee services here. A trip over tools work accident could leave you with a variety of different kinds of injuries and leave you suffering both physically, mentally and psychologically. These injuries can result in life-changing consequences for people, stopping them from being able to work and losing income. The right solicitor will be able to help you bring a successful compensation claim against your employer or other responsible parties (such as their insurance). Why do clients choose to work with us? We have a team of expert solicitors who are on hand to help with your case. We can work with your to offer a range of excellent legal services and general legal advice. Thanks to our experienced and expert legal representatives, you can benefit from our range of services. We can start reviewing your case through a free, no-obligation consultation. This talk will help to establish the credentials of your case. We aim to support you through you through your recovery and get you back on your feet. Take advantage of our comprehensive no win no fee personal injury compensation service. At Legal Expert, we are dedicated to representing your and fighting your case and will fight to get you the compensation you deserve. Many trip over tools work accident injuries are caused by slips, trips and falls. They can result in a relatively minor injury all the way up through broken bones and even in extreme cases result in brain damage to the injured party. We will have a much better chance of making a successful claim for you if we can demonstrate your injuries through medical reports and your employer’s accident report book. This will help us to show that you have been injured, that the injury was not your fault and that in this case, you were not at fault. It is in the interest of making a successful claim to get professional and expert legal advice straight away. At the start of your claim, we will always make it clear that no two personal injury claims are the same. Even if the resulting injury and the accident which caused it are the same, the result and effects of you and your life could be totally different. If you do not see a doctor and obtain a comprehensive medical report as well as having the incident logged in your employers’ accident report book, and if you do not see a solicitor at the earliest chance, you could jeopardise your claim. Ultimately, not getting these early steps right could mean that your claim is not successful or that your claim is unsuccessful. At Legal Expert, we are ready to work with you and getting you the compensation you deserve for your trip over tools work accident. We regularly work with clients who have had cases covering all kinds of workplace accidents. We can provide help and advice for anyone who has been injured in the course of their workday. Even if you are a guest of or visitor to a workplace you can still make a claim against the employer responsible for the area. We can start your claim today with an initial, free consultation. We’ll discuss your claim and possible compensation. Talk to our legal experts today. Fill in a contact form or use our online chat feature. Alternatively, you can call our experts today on 0800 073 8804. Find out your employer’s responsibilities in the workplace. We are happy to work with you on your slip, trip or fall claim. Accident At Work Claim – How Much compensation Can I Claim? If you have had a injury at work contact us today to find out if you can claim compensation.